If you love sharing social media and NIU is one of your passions, you’re invited to become a social media ambassador. The NIU Alumni Association is looking for social media ambassadors to share the impact of an NIU education during #GivingTuesday on Nov. 28, a day of philanthropy meant to encourage community participation in giving and to raise awareness about how gifts impact student success. Ambassadors are volunteers who simply spread the word about #GivingTuesday on social media. 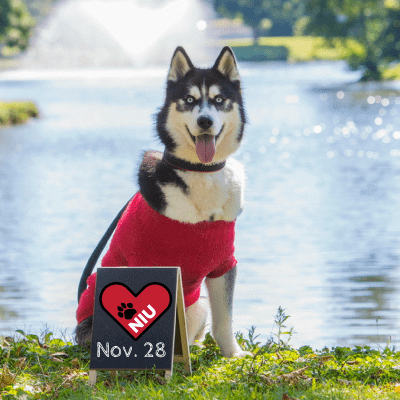 Volunteers will like, share or comment on posts made through NIU alumni and university social media channels and will share personal stories of #HuskiePride during the two weeks leading up to the event. “I became an ambassador for NIU because this is how I can give back to my alma mater right now,” said Carolyn Straub (’12), alumni relations coordinator for Benedictine University. Richard Lassin (’73, M.S. ’75), an exploration geologist and a retired director from Aquila Resources Inc., has also signed up as an ambassador because he sees how the university has been impeded by state budget cuts. “I have done well in my career and feel I have some obligation to support the university that supported me,” Lassin said. Last year, more than $124,000 was raised for the day of giving with the support of about 260 donors. With your help, NIU plans to inspire 400 donors this year. This fall, NIU Acting President Lisa Freeman announced her $25,000 gift to student scholarships to focus on the need and invited the NIU community to join her in showing support. To participate as a social media ambassador, sign up here. If you have any questions, contact Liz McKee, director of alumni volunteer engagement, at Lmckee1@niu.edu or 815-753-7400.